Kriti Sanon rarely experiments with her hair. Keeping it simple, she mostly wears them down in either sleek or wavy style. However, the actress recently gave her boring hairdo a slight twist. Kriti, who is currently promoting her upcoming film ‘Luka Chuppi’, went all out with a stunning boho hairstyle for one of her appearances and left us drooling. 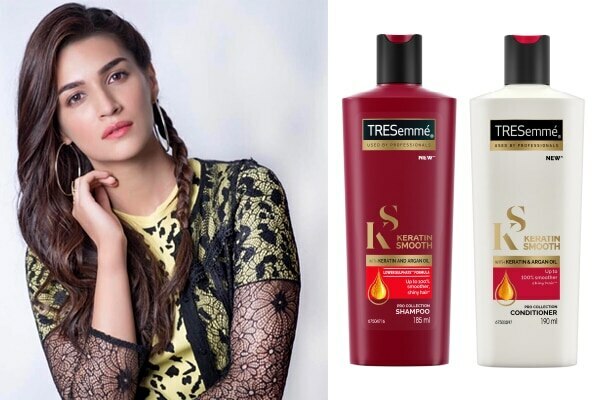 To ace this hairstyle, wash your hair a night before using the Tresemmé Keratin Smooth With Argan Oil Shampoo and follow it up with the Tresemme Keratin Smooth With Argan Oil Conditioner. This will give your hair a little extra texture to style with in the morning. To achieve a wavy finish, reach out for your curler and curl away from your face, section by section. Give your hair a side parting. Now, take the smaller side of your hair and tie off the remainder in order to prepare for a braid. Start making a reverse French braid by pulling each section under instead of over. Complete the braid until you run out of hair to add to the braid, and then finish it off with a regular braid. Secure it with a hair tie and let it fall on the side. Lastly, add volume to your braid by loosening each loop of the braid very slightly. Untie the remainder, finger-comb for added effect and finish it off with the Toni&Guy Finishing Shine Spray.